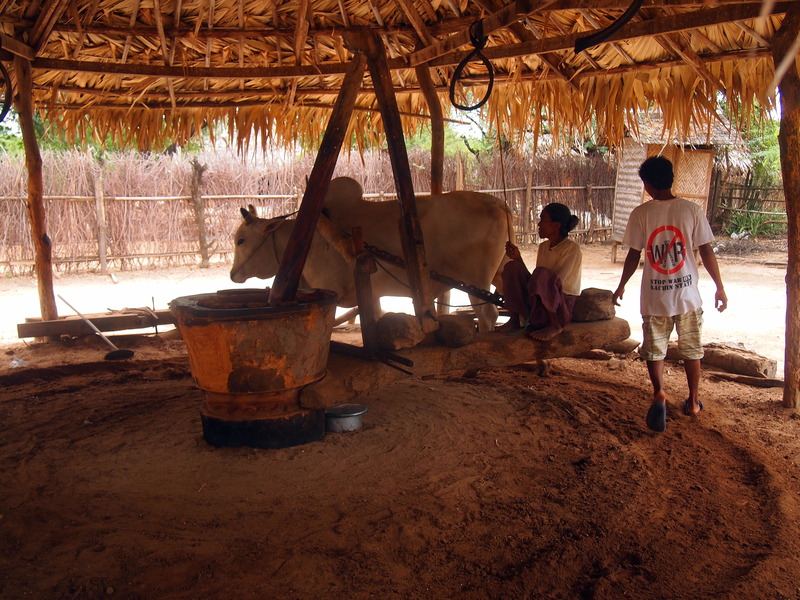 Pre- industrial forms of industry continue in rural areas of Myanmar. 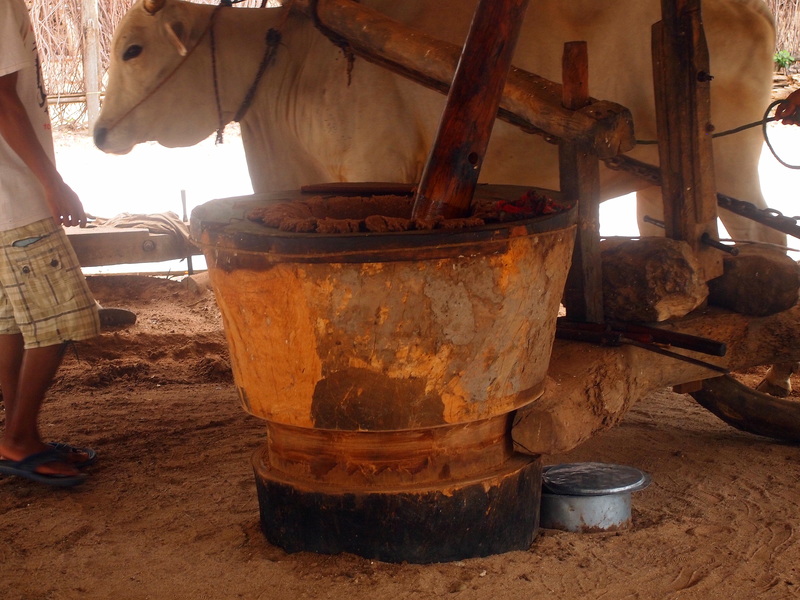 Step back in time and watch these oxen tread the same path, day in day out, as they turn these ancient cogs to extract peanut oil from the nuts. At this point, you may be feeling some pity for the poor oxen. No need. 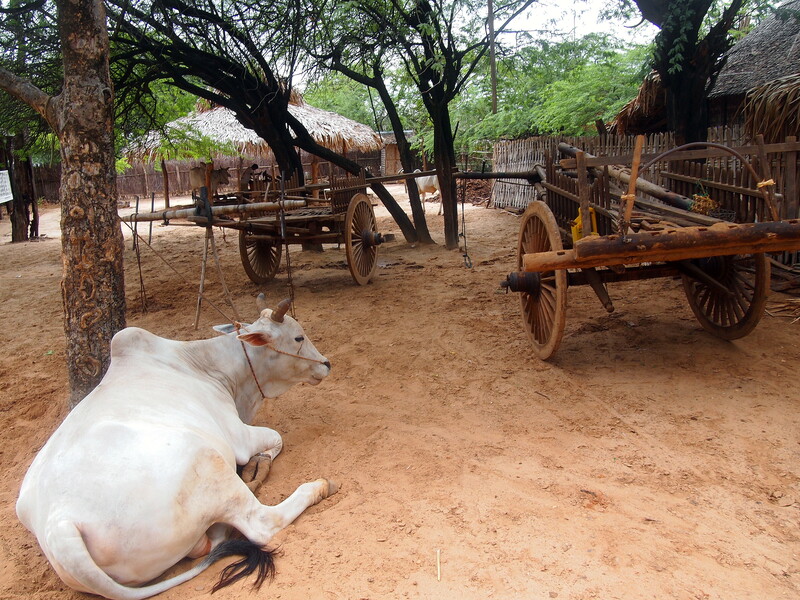 These oxen are very well fed and are rewarded for their work. Notice the eye of the beast. He knows that his twenty minute shift is nearly up. He watches the build up of peanut butter, a waste product and one that he will shortly enjoy. A break and a rest, a peanut butter snack, and it’s back to work. The photos below show the young men scraping away the peanut butter. The photo that is missing, but the one you can imagine, is the now still beast, his long tongue swinging and salivating in anticipation. Below is the other shift worker, resting and waiting for his turn. 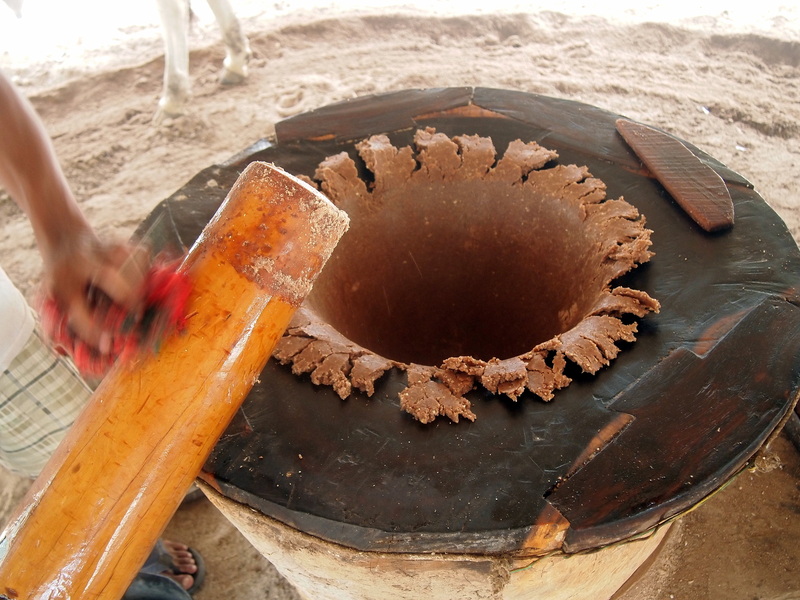 Peanuts are a major crop grown in Myanmar and peanut oil, freshly pressed in this manner, would be a prized oil indeed. What a great reward for the labouring beast! He really enjoyed his feast. I can imagine a few others around here would be salivating at the thought of eating that peanut butter as well as the bullock. Very interesting story Francesca. That oxen was so happy as he slurped it up- great to watch this little snippet of ancient industry. mmmm not sure Fran. I would have to morph into someone like you. Those are great images telling a very interesting story. thanks for this culture post – glad the oxen are treated so well – there are a lot of old sayings (quotes and proverbs) about oxen and I your post brings this emote to life for me. yes, I do recall a few old sayings about oxen and beasts of burden. Great shots and story. love the colours and the animal. Very interesting! Great photos and explanation too. 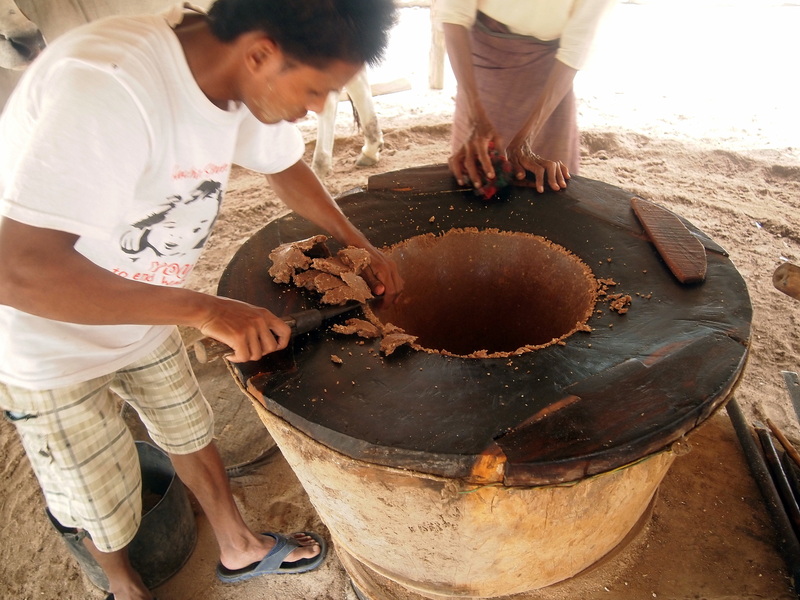 The ancient ways of doing things still linger in Myanmar, a fascinating but very poor country. Hi Madame Julie, the oxen loved that peanut butter- I was feeling quite happy for him as he slurped it up. I didn’t realise that that was how they made peanut oil! So interesting that it continues with this method to this day. The joy of travel is seeing all these interesting aspects and how cultures vary. Thanks. 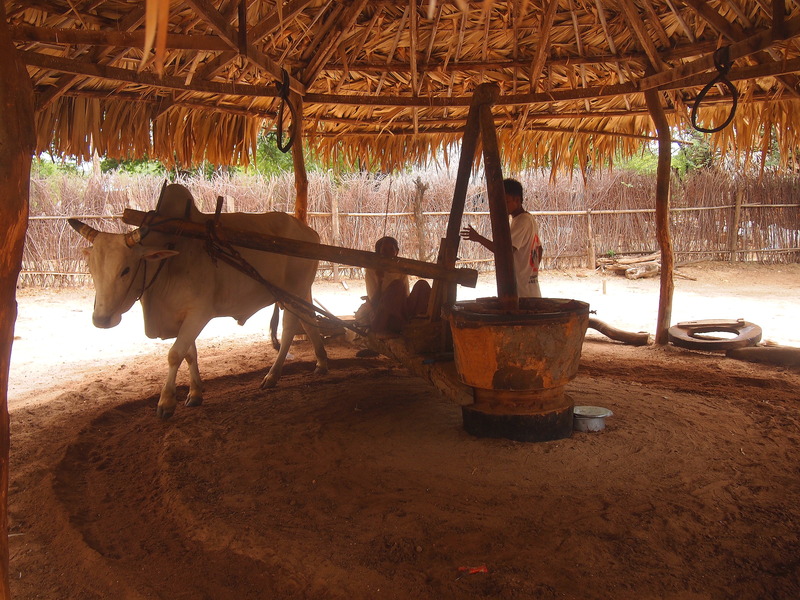 Myanmar is a fascinating country, but quite poor and ancient methods still linger. Previous Previous post: Tradition and Change in Ubud, Bali. Canang Sari. Next Next post: Rajma Curry and Back to the Budget.